75521SN is rated 5.0 out of 5 by 6. Experience a better shower with the control and flexibility of a Delta® hand shower. Great for showering yourself or your loved ones and pets, as well as for keeping your shower and tub clean. Delta® H2Okinetic® Showers look different because they are different. Using advanced technology, H2Okinetic showers sculpt water into a unique wave pattern, giving you 3X the coverage of a standard shower head. * The end result is a shower that provides more coverage, more warmth and more intensity for a truly drenching shower experience. So go ahead and indulge, because now you can enjoy the feeling of more water without using more water. While other products may gather unsightly mineral build-up over time, Delta soft rubber Touch-Clean® spray holes allow any mineral residue to simply be wiped away for an instantly refreshed look – with no need for soaking or the aid of chemical cleaners. The pause setting gives you ample space for shaving, lathering and other shower tasks, then easily restarts the water with the temperature where you left off. This spray setting helps you conserve water, so you can worry less about depleting your supply of hot water - and you help the environment too. Delta WaterSense labeled faucets, showers and toilets use at least 20% less water than the industry standard—saving you money without compromising performance. *Coverage measured in accordance with EPA WaterSense® Specification for shower heads, March 4, 2010. Rated 5 out of 5 by hammerham from Works just as expected Excellent product by Delta. Will order again for my other bathroom. 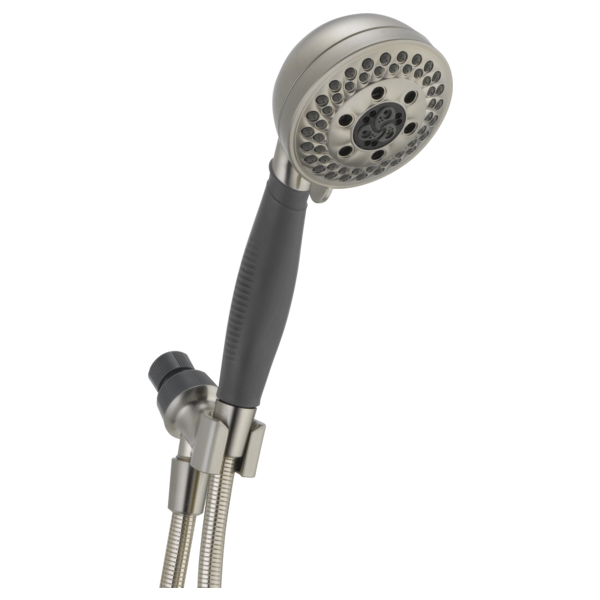 Rated 5 out of 5 by Verle from Nice shower head. Works very well. Different settings very useful. Makes rinsing easy for yourself and shower walls. Rated 5 out of 5 by Zapper from Much improved replacement of our Price Pfister. Provided excellent water pressure even with the flow restrictor. The different settings are actually distinctively usable. Rated 5 out of 5 by SteveH from Excellent flow This was easy to install and vastly improved the flow through an upstairs bathroom shower. Extra long supply hose makes it easy to use to spray the soap off of your body. Rated 5 out of 5 by Mychelle7 from lightness, water saving and water distribution are my main concerns I am very pleased with the design and funcionning. Rated 5 out of 5 by CHURJOY from GOOD PRODUCT EVERYTHING ABOUT THIS PRODUCT IS GREAT. IT IS EXACTLY AS ADVERTISED. MY PROBLEM IS THAT I DIDN'T READ ABOUT IT FIRST. I DID NOT WANT THE WATER SAVER. I AM GETTING USED TO IT AND LIKE IT FOR WHAT IT IS. How do u change from setting to setting? Two concerns: 1. Shower head would flop left or right while in the shower mount. Though the instructions make no mention of tightening the shower mount (opposite side of the ball joint on the shower arm mount), I could not tighten the nut by hand tight enough to prevent the swiveling from side to side. Had to use slip-joint pliers to secure it. 2. The shower head does not fit securely in the shower mount arm and has fallen out of the holder several times. I push down to seat the shower head in the holder but it will rise back up slightly. Hopefully this will eventually &quot;break-in&quot; and seat properly. Any suggestions? is there a filter in this unit that could get pluged and cause flow reduction? are there any plastic pieces on this hand shower? How does the hand shower mount to the wall? Is it mounted permanently with screws or adhesive?